Does Obama Have an Asian Problem? As Hawaii's primary takes place on Tuesday, Barack Obama ought to be sitting back with an umbrella cocktail. After all, it's the state where he spent many of his childhood years. He graduated from the prestigious Punahou School in Honolulu, and his half-sister, Maya Soetoro-Ng, still lives and works there. Along with his wife and daughters, the Illinois Senator returns occasionally for family reunions. But while there's a good chance much of Hawaii's nearly 60% Asian-American population will be squarely behind Obama, the same can't be said for Asian-Americans in the rest of the country. So far this campaign, that is the one ethnic group that has voted most consistently — and overwhelmingly — for his rival, Hillary Clinton, generating a debate that has raised a very sensitive, ugly question: could some Asian-Americans not be voting for Obama simply because he's black? In California, where Asian-Americans make up 8% of the electorate, a CNN exit poll found they voted three to one in her favor. In New York, the Asian American Legal Defense Fund's exit poll concluded that 87% of Asian-American Democrats backed their state's Senator. In New Jersey, it was 73%. From no other group did Clinton command that kind of loyalty; she won 69% of Latino voters in California, for example, compared to 75% of Asians. Publications including some local editions of ethnic newspapers like Sing Tao have endorsed her, as have prominent politicians including former Gov. Gary Locke of Washington and Sen. Daniel Inouye of Hawaii. And while Asian Americans, accounting for just 5% of the population, may not have the numbers to sway the nomination one way or another, their overwhelming support of Clinton has led to a serious debate about what might lie behind it. Experts have speculated about a variety of possible reasons having little to do with race: Like other new immigrants, Asian Americans are more conservative in their choices for leaders, and therefore likely to go with the known entity — which in this race, thanks to her husband and her time in the White House, is Clinton. Many Asians are business owners who prospered under Bill Clinton. Just 34% of Asian Americans between the ages of 18 and 25 vote, according to a slick commercial by MTV's Choose of Lose Campaign, which may eat into Obama's poll numbers. Perhaps most significantly, the Clinton campaign had long ago locked up support from local politicians, who hold unusual sway over their ethnic communities. But the touchy question about race is the one getting the most attention. When CNN's Anderson Cooper 360 ran a piece by Gary Tuchman earlier this month implying that racism may play a role in Asians' voting choice, the outcry was instantaneous. The 80-20 Initiative, a political action committee seeking to solidify 80% of Asians in one voting bloc and backing Clinton, organized a petition demanding that CNN run a corrected segment. Asian bloggers, who skew disproportionately toward Obama, shot off paeans of support disputing CNN's theory. They pointed to prominent Asian-Americans like Norm Mineta — the former Commerce Secretary under Bill Clinton and Transportation Secretary for George W. Bush — who have recently pledged allegiance to the Obama camp. Still, the fracas has stirred some quiet debate in the community. "Maybe it's just my cynicism speaking, but you look at those numbers and on some level there has to be some element of race," says Oliver Wang, a sociology professor at California State University at Long Beach. While not discounting the myriad cultural reasons that could explain the support for Clinton, "on a gut level my reaction is that at least some Asian Americans are uncomfortable voting for a black candidate." Wang, 35, who grew up in the U.S., voted for Obama in the California primary. He is a child of Taiwanese immigrants, and believes that foreign-born Asian voters in this election may be leading the Hillary Clinton support. In his view, those voters tend to hold more conservative views; Obama's mantra of change and bold rhetoric could remind some of the unstable governments they fled; and they may cling to warm perceptions of Bill Clinton shared in their home countries. But Wang also suspects that race lurks among the possible reasons behind Asian immigrants' reticence to back Obama. "The images of African Americans that get exported to other cultures is not often positive," says Wang, who teaches about pop culture and race. "It's not unusual to find new immigrants who have never had a meaningful, personal encounter with an African American. So there's a very uninformed bias," says Wang. "Obama is a different kind of African American," he adds. "His background doesn't date back to slavery; he's half-black, half-white; he grew up in Indonesia and Hawaii. In other words, he's not Al Sharpton. But those nuances get lost when someone comes from a foreign country. To them, it doesn't translate." Some observers think that Obama simply hasn't made enough of an effort until recently to go after the Asian-American vote. For instance, some Asians were sensitive to being left out of Obama's rousing stump speeches on racial unity — speeches that mentioned only black and white, according to Don Nakanishi, director of the Asian American Studies Center at the University of California Los Angeles. But following his clean sweep of the Potomac primaries on February 12, Obama pointedly thanked a rainbow of ethnic groups, including Asian Americans. "He can turn it around," says Nakanishi. "He has a story to tell, one that we would get." The tide may already be turning. Since Mineta's surprising endorsement in February, the former cabinet member has joined the campaign as a surrogate to encourage the support of Asian-Americans. Soetoro-Ng, Obama's sister, has campaigned actively in Hawaii, conducting interviews and appearing at phone banks and picnics; she is often joined by her husband, Konrad Ng, who is of Chinese descent. The campaign is also running ads on Japanese-language TV networks in Hawaii. Five members of the Congressional Asian Pacific American Caucus support Obama. Asianweek endorsed Obama on its cover. "Asian-American voters are no different," says Tommy Vietor, spokesman for the Obama campaign. "Once they get to know him and know his ideas, we have their support." Alan Shum, 24, an analyst for an investment fund in New York City, cast his vote for Obama. But he also thinks his elders might have a problem doing the same. "Voting for a black candidate is just not something that would jump out at them," he says. "Chinese people are really racist at times." He points to the colloquial Chinese for "white" and "black," which append both words with "devil." "The vernacular tells you a little about something," he says. "Chinese people can be very, very insular as a culture — very superior. We look down upon any race that isn't Chinese." What's more, there's the gender factor. Many Asian cultures are patriarchal, and Clinton is the only female candidate in the field. But despite their cultures, many immigrants from those countries may in fact be more familiar than Americans with a female leader: Indira Gandhi in India, Gloria Macapagal-Arroyo in the Philippines, Benazir Bhutto in Pakistan. And many of those leaders, like Clinton, were married to or descended from former leaders. For Lien Murakami, a systems programmer in Oakland, Calif., however, her choice came down to something far more specific: Clinton's proposals on aid for Iraqi refugees. A Vietnamese refugee herself, Murakami, 30, looked closely at the two candidates' stands on that topic among others and found Clinton's uniformly more detailed and realistic. The racism charge, she says, is offensive to voters like her and her Japanese-American husband, who conducted extensive research before casting their votes. "It's generalizing to say that if you support Hillary, you're not thinking about the candidates but going with what your community leader is telling you — and that you're racist to boot," she says. All this leaves his state very much in the air, says Ira Rohter, a political scientist at the University of Hawaii at Manoa. Race will most certainly play a role, he says — but perhaps not in the way mainlanders might think. For one thing, since Asians are a majority there, voters tend not to think of themselves as one minority voting bloc struggling to make an impact, but rather as sub-groups of specific ethnicities. For another, Obama, being of mixed race, is a familiar entity: two-thirds of babies born in Hawaii are so-called hapas, says Rohter. "Of course," says Rohter, "he's half black, which is different." Blacks make up a barely visible minority in Hawaii. But historically, many have been members of the military, which retains a presence there — and there is a long history of a "certain tension" between servicemembers and native Hawaiians, who once saw them as an occupational force. Nevertheless, Don Nakanishi of UCLA expects Obama to "do well" in Hawaii. There are signs the voting bloc long ruled by the Democratic machine there is breaking up, as young and independent voters register for its closed caucuses in unprecedented droves. 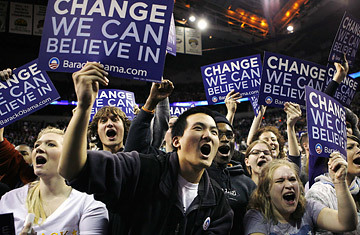 Nationwide, as Obama's campaign catches a glimpse of the finish line, it will likely pour more effort into winning over previously written-off groups like Asians. They've already won over Nakanishi — he voted for Obama earlier this month.